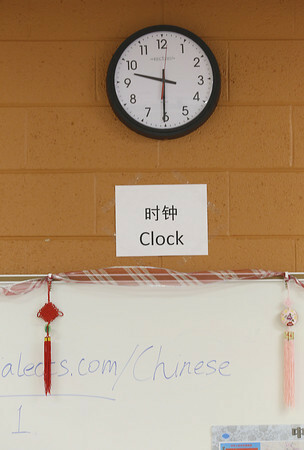 A classroom clock sits above it's Chinese and English translation in Chinese class Friday at the International School at Bertha Vos Elementary. Traverse City Area Public Schools school board will vote Monday on a proposed partnership with a Beijing-based private school. TCAPS leaders hope the partnership, which could bring up to 200 Chinese students to Traverse City high schools annually, will bolster district efforts to prepare students for an increasingly global world.